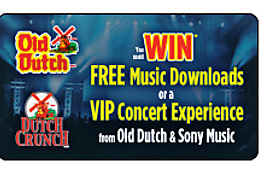 Here at Old Dutch we love to give out prizes and we think we give out some pretty fantastic ones! Congrats to Jennifer S. from Edmonton, Alberta, who is on her way to a VIP Concert Experience of her choice courtesy of Old Dutch and Sony Music! You better wear earplugs, because this thing could get loud!